Recently Dave and I were given the opportunity to experience the Fly Borgata program. 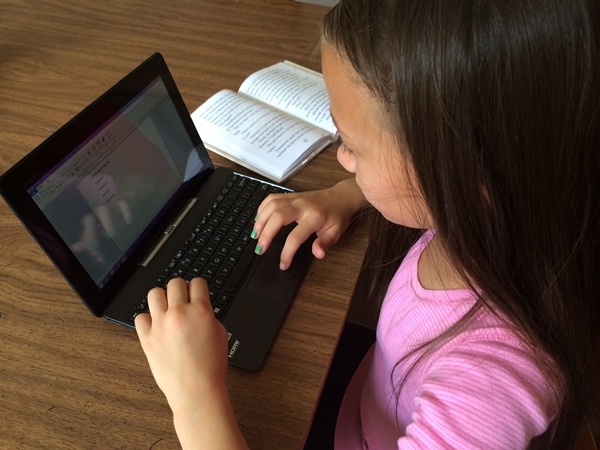 As part of the program flight, accommodations, and meals were provided. The Fly Borgata program. 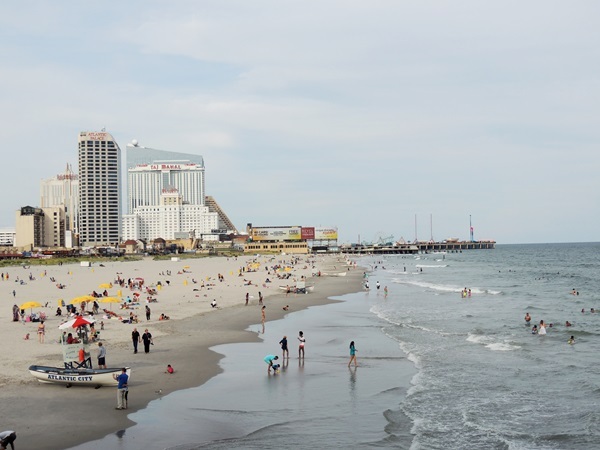 Fly Borgata is the new luxury travel program offered by the Borgata Hotel, Casino, & Spa in Atlantic City. 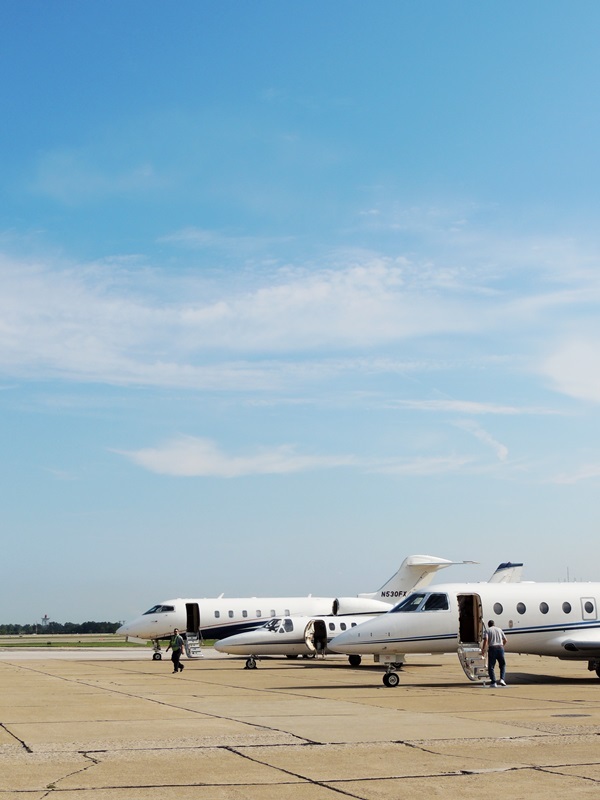 It offers charter jet flights, a world class resort experience, and on property VIP service. The trip itself started off much different than any other trip we’ve been on. 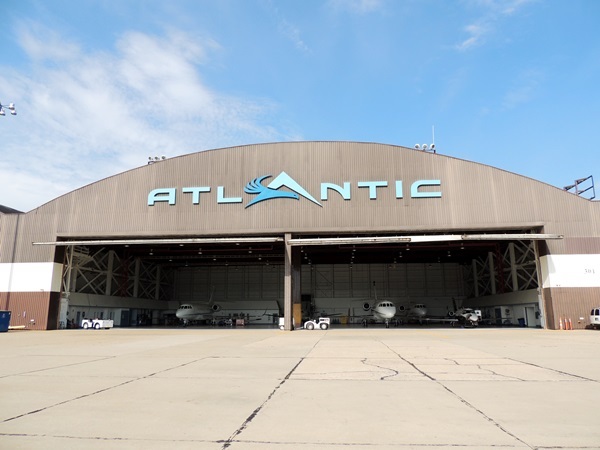 We drove right past our normal exit for Cleveland Hopkins airport and just an exit or two away we found ourselves at the Atlantic Aviation Services hanger. We were happy to see the parking was free and gated in a secure area. We parked our car and were giving a short ride in a golf cart to the office and lounge where we checked in. In just a matter of minutes we had gone from our car to sitting in the comfortable lounge drinking complimentary flavored coffee while we waited to board the plane. Once we it was announced we could board we headed out to the tarmac to board the plane. We were excited that there were no baggage fees to worry about & dropped our luggage off with the baggage handlers. Having never flown on a charter jet before I couldn’t wait to see what it looked like both outside and in. 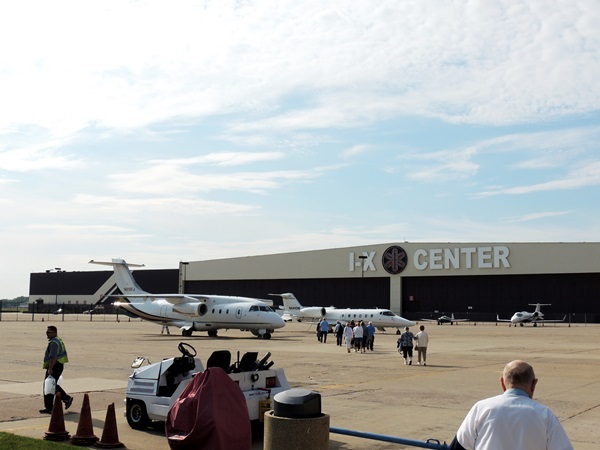 The jet used for the Fly Borgata program from Cleveland is a Dornier 328. 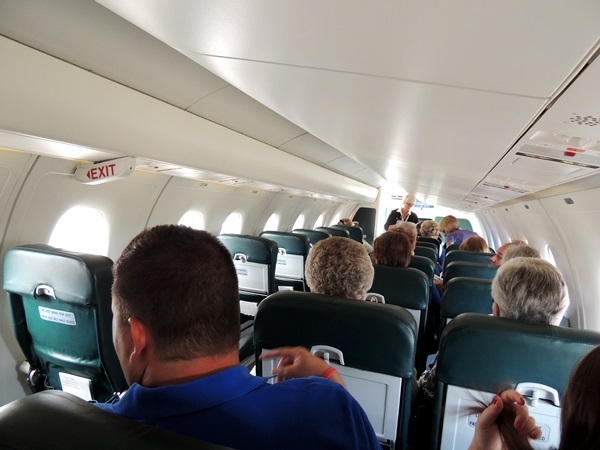 It seats 30 people, has large 6’2″ cabins, all leather seats, and there is a flight attendant who offers complimentary drinks and snacks. 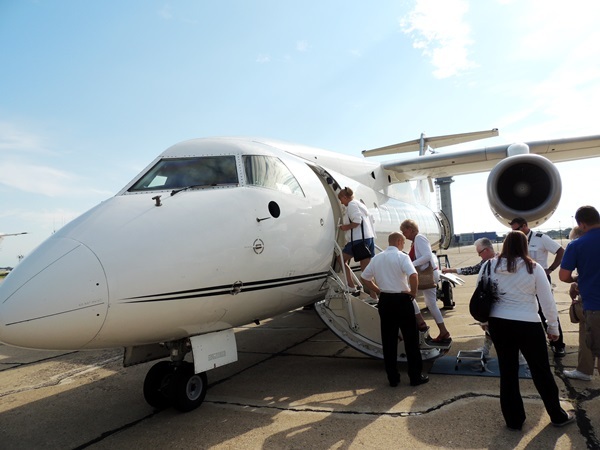 We were impressed with the jet and found the flight to and from Atlantic City smooth and comfortable. I liked that we flew lower than on a commercial airline so I could still identify things on the ground which is one of my favorite things about flying. 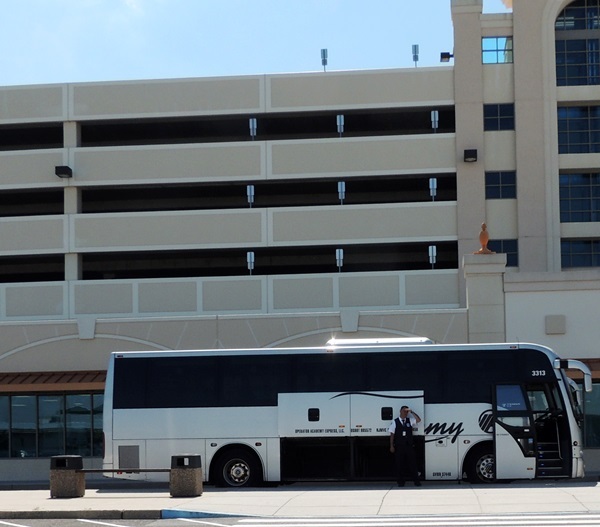 When we landed in Atlantic City, we were grabbed our luggage and were greeted by a a Borgata employee who directed us to a luxury direct shuttle bus for the quick 15 minute ride to the hotel. 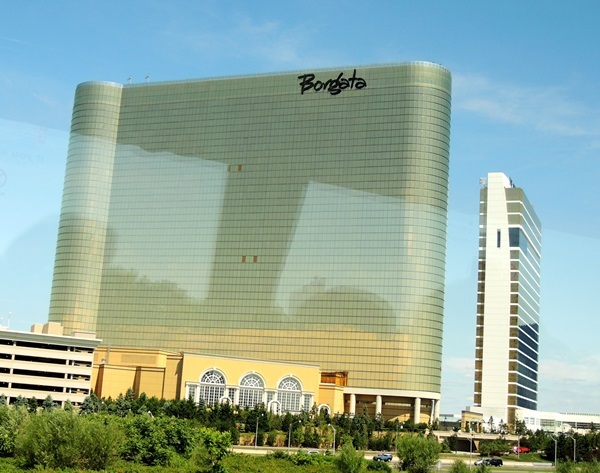 As soon as we spotted the Borgata from the bus Dave and I were excited. It was glittering and gold and calling to us to stay, play, relax, and have fun for a few days. 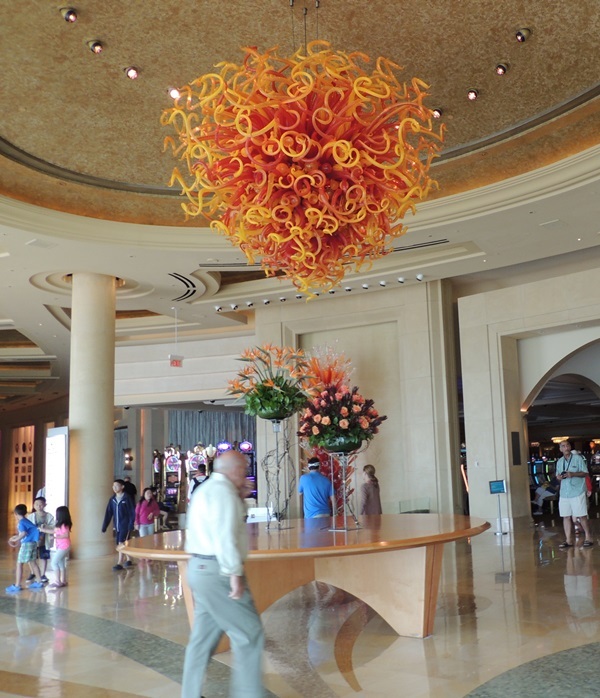 We entered the lobby and I couldn’t take my eyes off the beautiful Chihuly sculpture hanging from the ceiling. 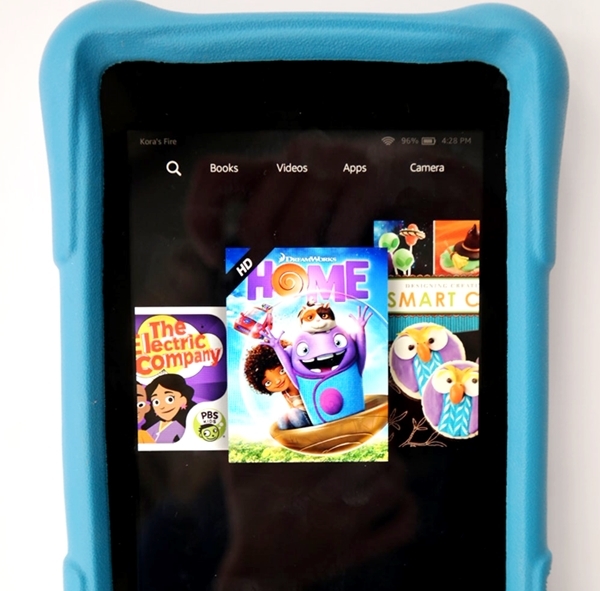 It is eye-catching, colorful, and a thing of beauty. My parents visited the Franklin Park Conservatory in Columbus, Ohio not too long ago and fell in love with Chihuly’s work. They took numerous pictures and now that I was able to see a piece with my own eyes, I could understand why they enjoyed it so much. 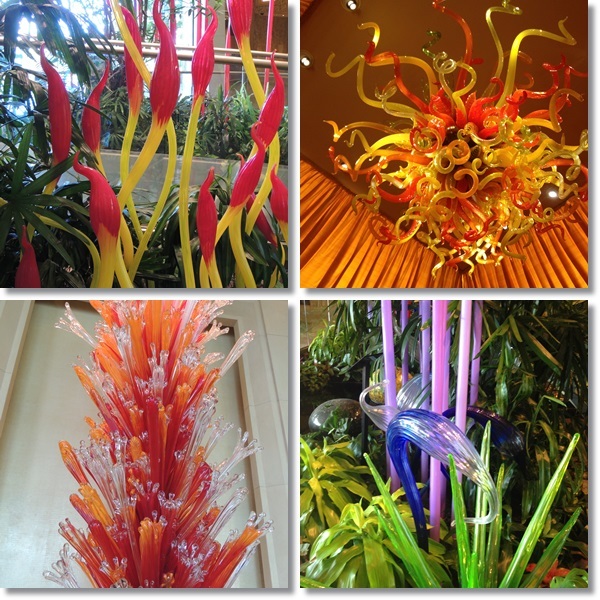 Dave and I were excited to see many others Chihuly pieces displayed throughout the Borgata during our stay. They are wonderful conversations pieces and truly gorgeous pieces of art that fit in well with the hotel decor. 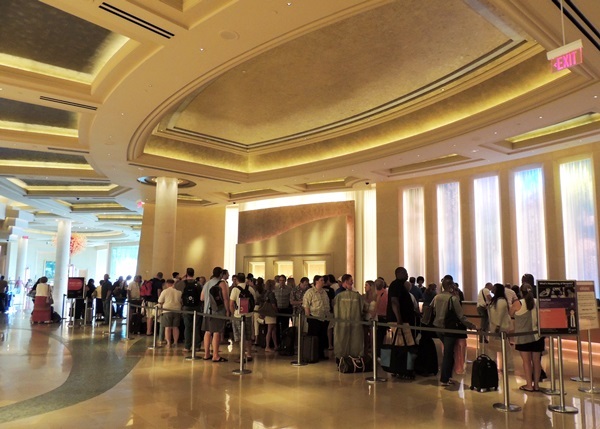 We were happy to see that we were able to use the Fly Borgata Express VIP Check-In. It saved us from standing in a line like this. Even though we arrived before noon our room was ready and we had our key in hand in minutes. 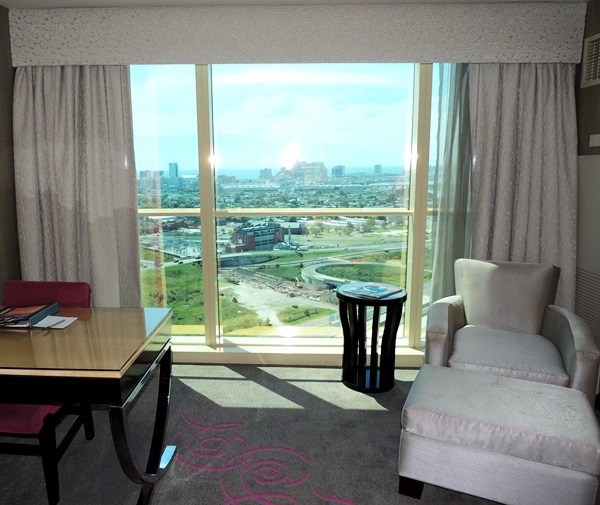 We headed upstairs and the first thing that caught our eye was the view from our floor-to-ceiling windows. It was a beautiful site! We enjoyed the room and liked the decor as well as the amount of storage. The tv was nice, it was HD and the picture was very clear. The desk was large and the chairs were comfortable. The bathroom was also a nice size and the shower was huge. Here’s a video I made showing the room. 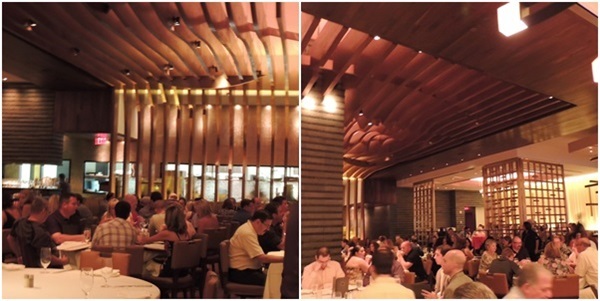 While we were at the Borgata we were pleased with the number of restaurants there were to choose from. 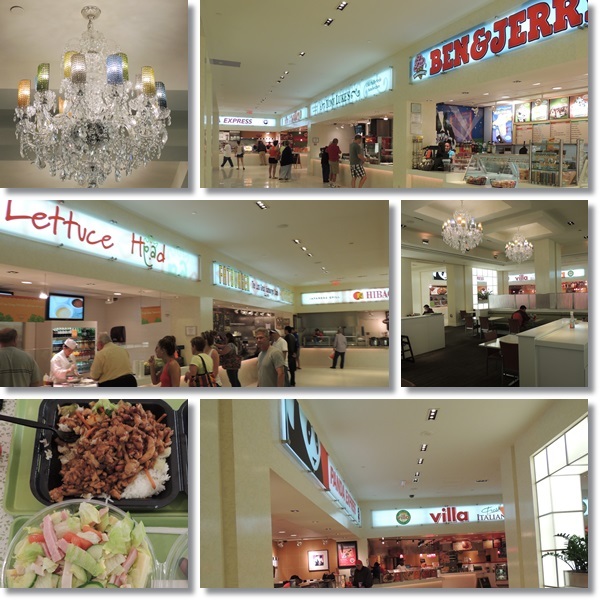 There were elegant and fine dining options as well as a number of cafes, and even a food court with options you may find at your local mall. The first day we grabbed lunch here. I was impressed with the nice high end touches in the food court. While the area is called The Cafeteria and it held on to the feel of a food court but also had details like shimmering chandeliers and colorful tabletops. Dave ordered a combo meal from Hibachi San and I had a salad from Lettuce Head. We were both pleased with the prices and the amount of food we were given. Our lunch was delicious and we were happy to have eaten there. Our favorite place to dine was Bread & Butter. 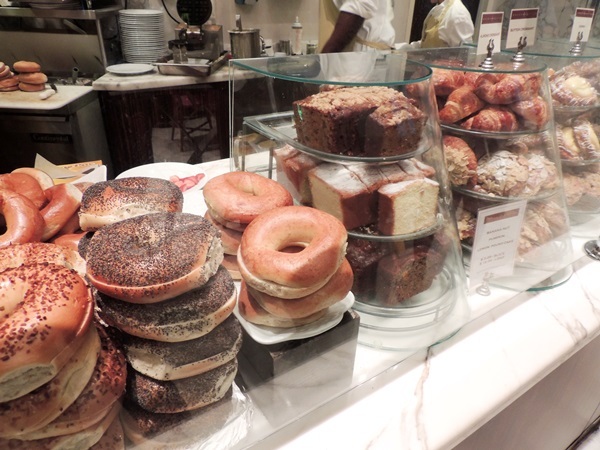 The menu is incredible, their menu items match their mouthwatering descriptions, and they serve breakfast all day. We enjoyed this restaurant so much we went there a couple of times. 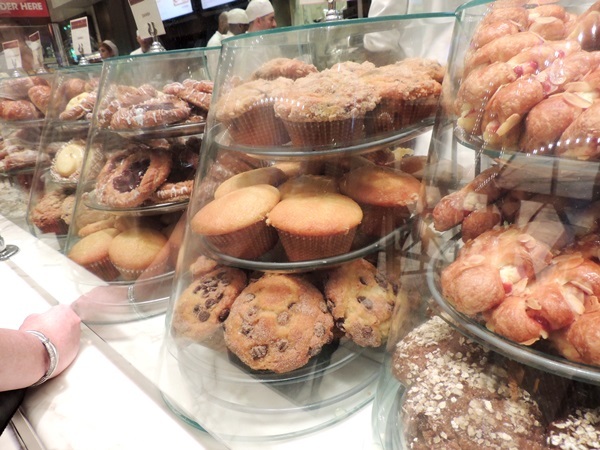 I had a delicious warmed chocolate chip muffin and a toasted and buttered croissant for my meals. I’m not much of a breakfast person, but I do consider myself a connoisseur of croissants and muffins and these both were soft, buttery, and divine. The first time we went to Bread & Butter, Dave ordered an egg & turkey sandwich on a biscuit and said it was delicious. The second time ordered waffles with strawberries and whip cream. 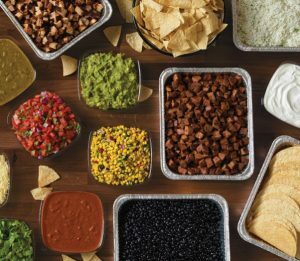 He liked them and I had a taste and while I loved my order, I found myself wishing I had room to place an order for myself! 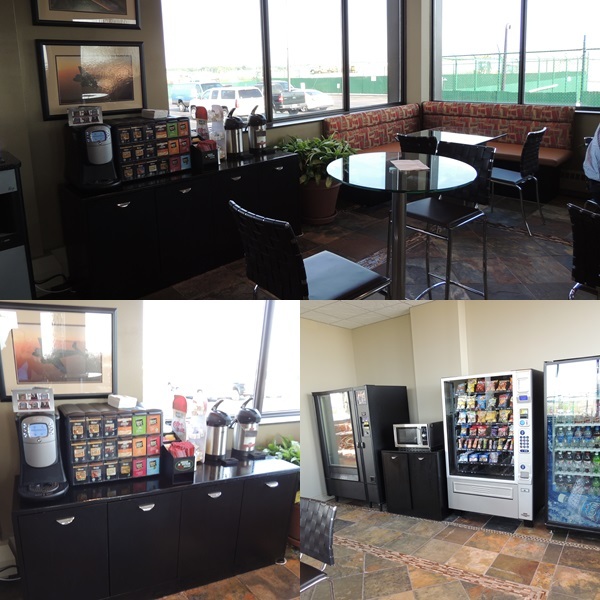 I was excited to see there was a Starbucks and I looked forward to enjoying a fancy coffee every day. We also had the chance to eat dinner at Bobby Fly Steak. We were impressed by the atmosphere and the unique decor. We were seated at a table for two where there was a long bench that ran the length of the wall and a single chair opposite each table. We did feel just a bit on top of our neighbors but everyone was friendly and we chatted with other diners a couple of times throughout our meal which wouldn’t have happened had we had a different seating arrangement. We did remark that for as full as the restaurant was we found it amazing we could hear each other so well. I’m not sure how the acoustics worked where we were sitting but it was nice to be able to speak in our regular voices and not have to yell over the din in the background. 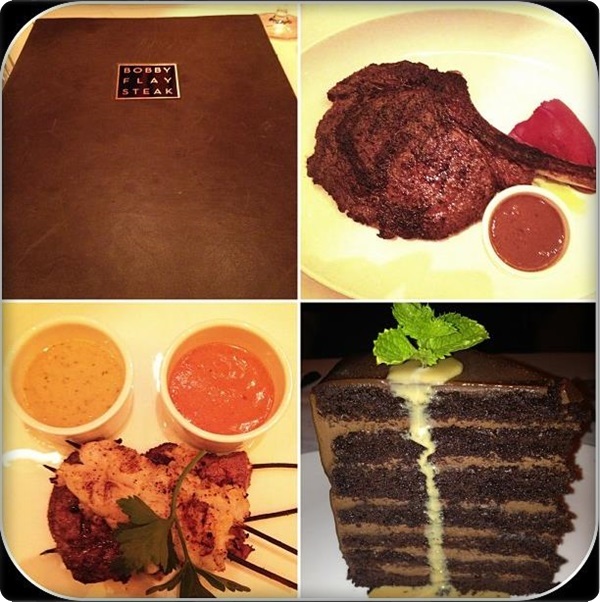 The service was impeccable and our server was polite, kind, and quick an the meal was fantastic. Dave ordered the Bone-In Ribeye and said it was one of the best he’d ever had. I tried some and agreed it was amazing. I ordered the Surf & Turf Skewers which was lobster and filet mignon. My steak was just as good as Dave’s and I was happy to have ordered it. While my meal doesn’t look very big, that’s because I had a plan. Dessert! I had been looking at the dessert menu the entire meal and when it came time to order I couldn’t wait to try the Dark Chocolate Espresso Cake. It came out looking so picture perfect I confess I was a bit sad to cut into it. But I was glad I did, it was fantastic! There was a little sprig of mint that Dave cut into pieces and tried along with each bite of cake, it added just the right touch of flavor. This cake was wonderful and large enough that we shared a piece and still coudn’t finish it. If you go to Bobby Flay Steak I recommend this cake and be sure to bring your appetite and a love for chocolate! During our stay we had a chance to check out the pool and the fitness center. 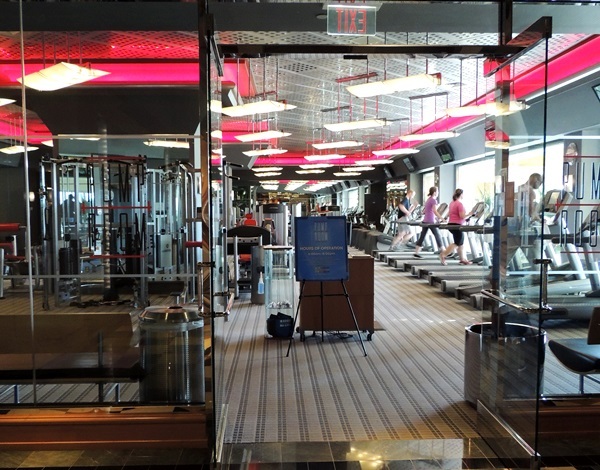 The pool was lovely and the fitness center was full of modern and up-to-date equipment. 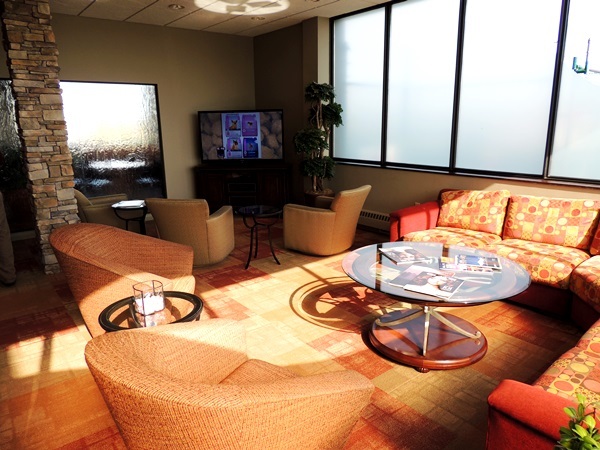 The cost to use the fitness center is $12 a day. 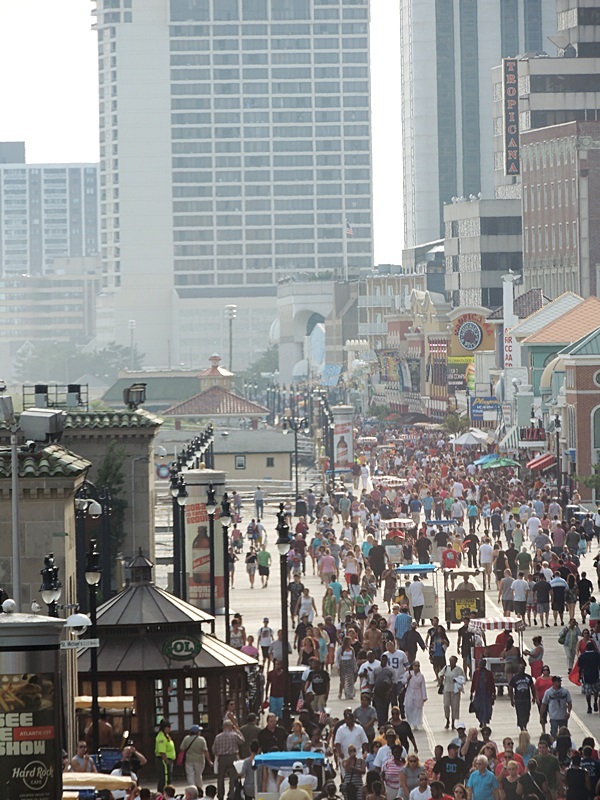 Having never been to Atlantic City before, I have to say we were a bit surprised by how far off the Boardwalk the Borgata is. Honestly, from our room it looked like a straight shot and an easy walk to get there, however because of all of the highways and busy roads surrounding the hotel it ends up being about a 3 1/2 mile walk once you make your way around everything. At first we were disappointed but then we discovered the Jitney. The Jitney is public transportation in the form of mini-shuttle buses. They arrive at the Borgata every 5 minutes or so (at least it seemed like one was there every time we turned around) and it’s only $2.25 a person for a ride anywhere along the route which includes the casinos on the Boardwalk. One word of warning though, it’s quite a bumpy ride. We rode on it 3 or 4 times and every single driver drove just like the last with short stops, rapid accelerations, and lots of bumps. Even so we thought it was an affordable, convenient, and quick way to get to where we wanted to go and provided us with a few laughs along the way. 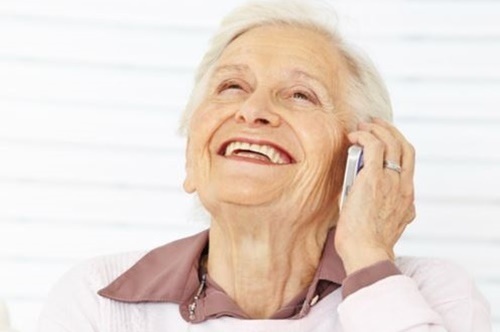 We did take a taxi from the Boardwalk once and it was $15 without tip. I’m not sure if they all charge that since we were two people in a minivan but I thought it was good to share in case anyone was curious. 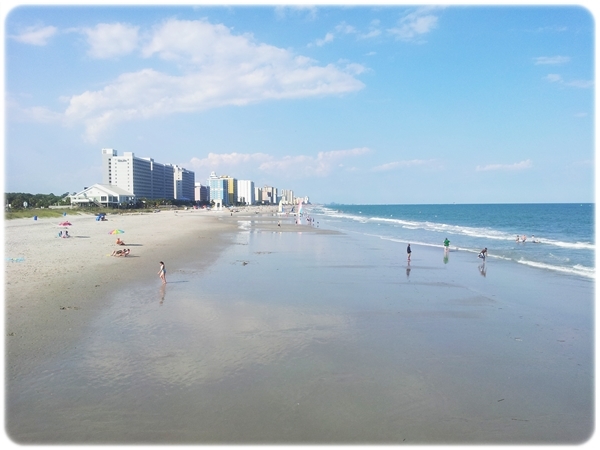 We enjoyed our time on the Boardwalk and had a couple of nice days to walk around and check out the shops and the beach. 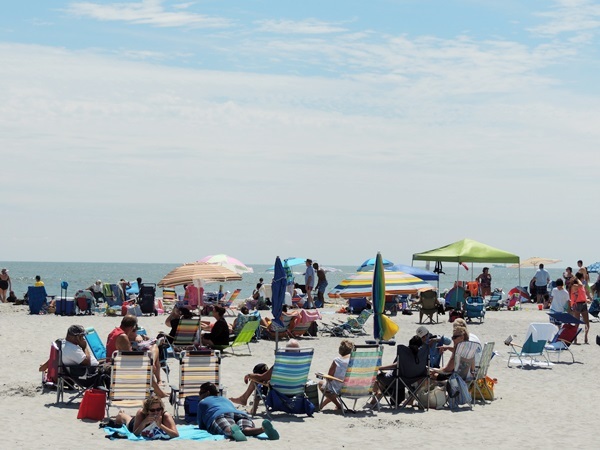 Speaking of the beach, while we were at the Borgata we were excited to discover that on Saturdays and Sundays they offer a shuttle to Brigatine Beach every 45 minutes. 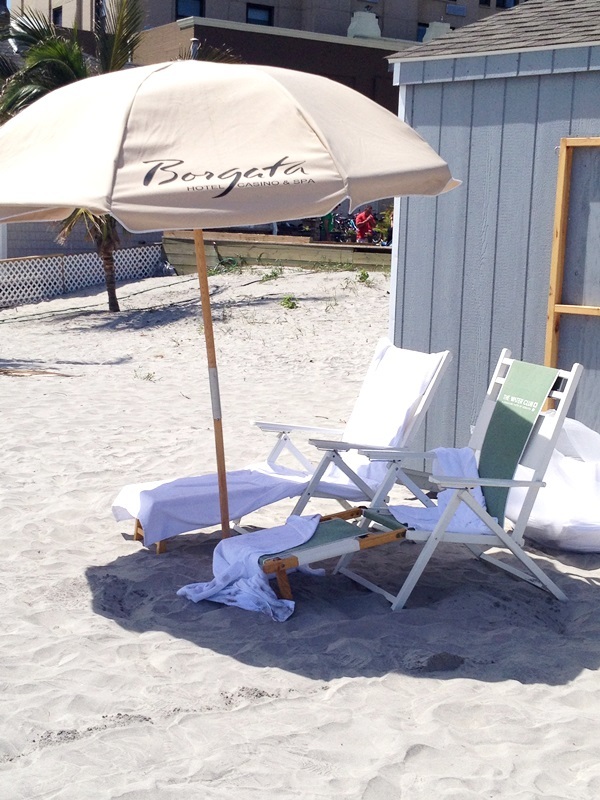 Once there Borgata employees are available with towels, chairs, and umbrellas. They will even place an order for you at the restaurant on the beach and bring it to you. I don’t believe all of these options are complimentary however they sure beat lugging everything to and from the beach yourself. 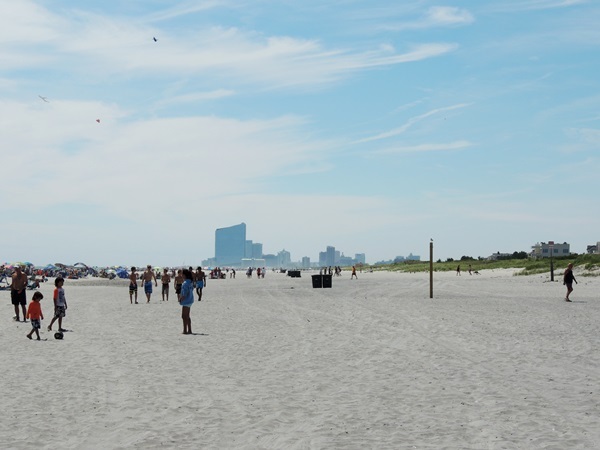 We had a chance to take the shuttle and check out the beach and thought it was lovely. I can see why it’s so popular, the sand is pretty, there’s room to fly kites, and the waves are enticing too. 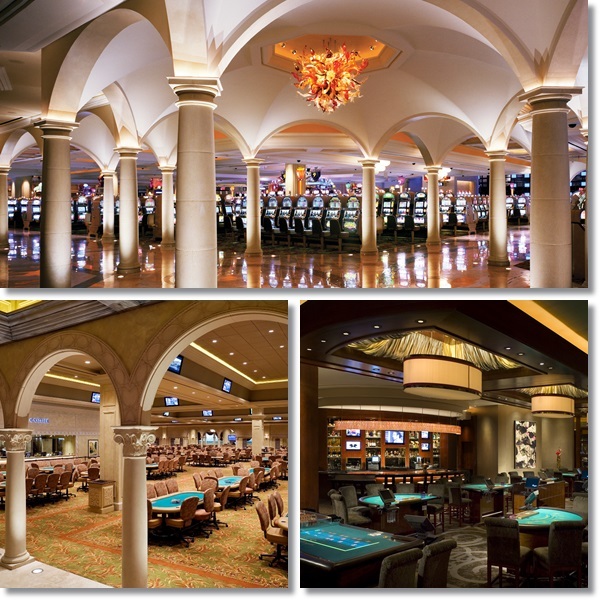 As for the casino at the Borgata, it’s 161,000 square feet and has 3,153 slot machines, 182 gaming tables, and a 80+ table poker room. We did play a few games but luck wasn’t on our side this time. You can’t take photos in a casino so that’s why I don’t have many of our own to share but here’s a few of the Borgata’s that represent it well. Before long it was Sunday and it was time to head home. We were given a late checkout of 2 pm which was wonderful and we didn’t have to meet to get on the airport shuttle until 6:30 so we had all day to play. It was a nice way to spend the last day of our trip and we had a good flight back. It was wonderful landing in Cleveland and being home without the hassle of checking bags, waiting for our bags in baggage claim, finding a taxi or waiting for someone to pick us up. 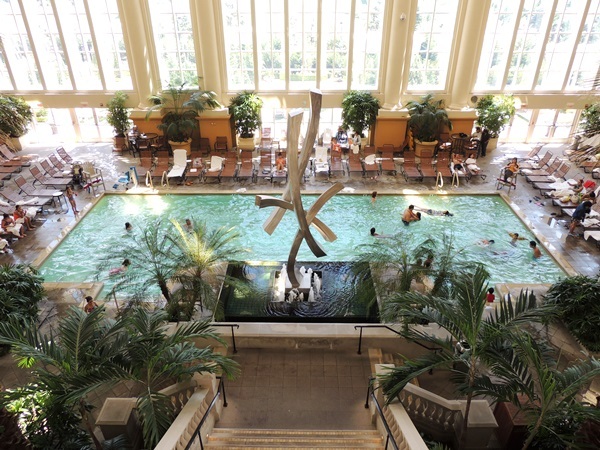 This Fly Borgata program really had us enjoying the lap of luxury and we could get used to it! This looks like a great time thanks for sharing I had no idea this existed until i read your review. Great pictures too thanks for sharing this one. I absolutely LOVEd following this via instagram. I never knew such a thing even existed! Wow, this looks like an amazing place to escape! I’ll have to check it out for our next getaway. 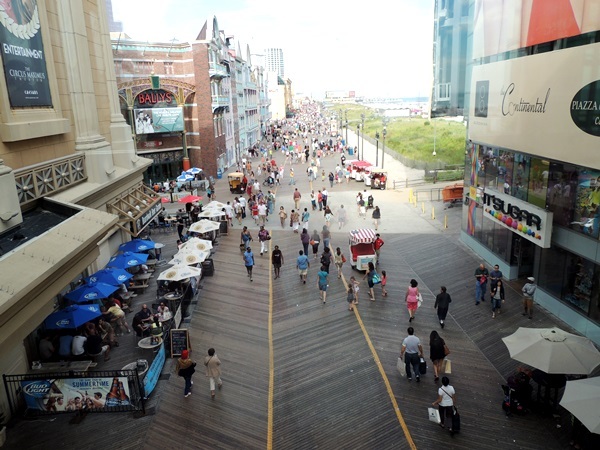 What a fun trip, Atlantic City is on my list of must do’s and this looks like a fantastic way to experience it! 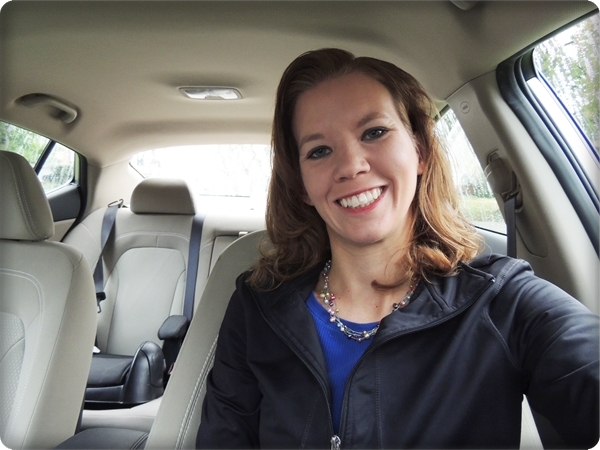 Great review Tesa!